I was sharpening some charcoal pencils and realized this might be a good subject to cover. I sharpen the charcoal pencils differently for more freedom and flexibility when drawing. As you can see to the right, I learned to sharpen my charcoal pencils to have a long sharp point. This is because I have been taught to use the charcoal pencil more like a paintbrush and to draw using the whole movement of the arm rather than just the movement of wrist. To draw this way requires the pencil to be sharpened in a different manner than I normally would sharpen other types of pencils. 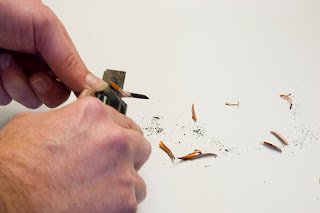 Today, we are going to look at how to sharpen a charcoal pencil in a way that exposes more of the charcoal, making the pencil easier to use and allowing us to take advantage the medium more effectively. Let's look a the benefits for sharpening the pencil this way. 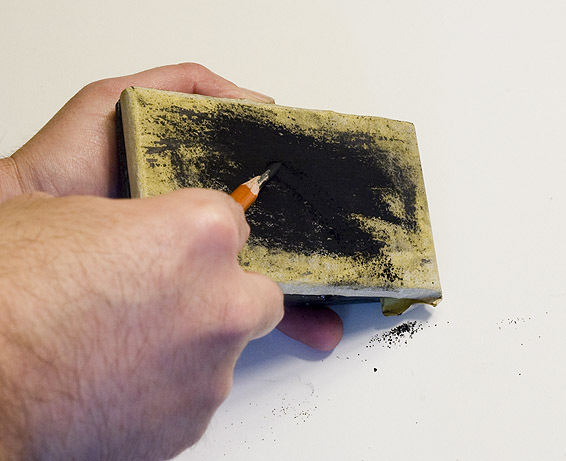 There are a couple of good reasons for sharpening the pencil to expose more of the charcoal as shown above. One reason is it just lasts longer between sharpening. 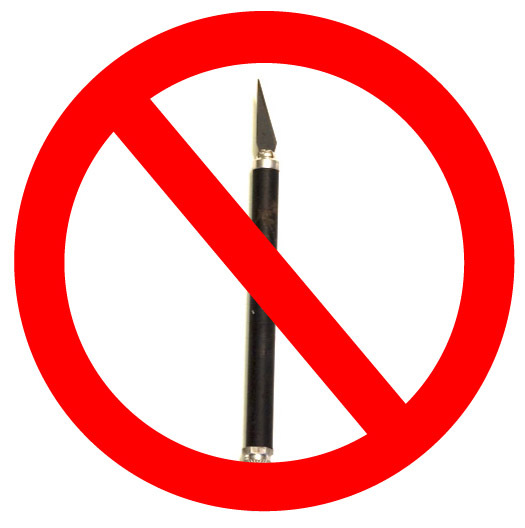 We will not need to sharpen our pencils nearly as often and can focus on the drawing longer between sharpening. The other reason is that with more of the charcoal exposed the pencil becomes a more flexible tool. For example, I can use the sharp point of the tip to draw a fine line or or the side of the exposed charcoal to shade with broad strokes. Holding the pencil more like holding a paintbrush, I am able to move the pencil around with more freedom of movement, varying the type of line I am able to draw. A. 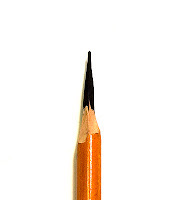 A knife to remove the wood of the pencil. Advantages: easy to grip, very sharp, sturdy blade. Disadvantages: blades are designed to snap off and dispose of at the top, must be careful not to extend the blade to far out. Disadvantages: Not a very good grip for sharpening a pencil. Not as easy to control. 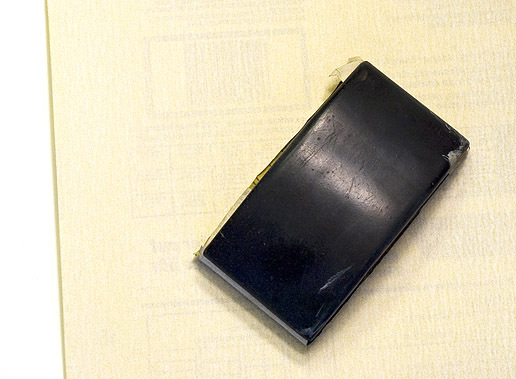 You can buy the sanding blocks designed for sharpening pencils, but I find using a piece of 220 grit sandpaper is a cheaper and easier way to go. 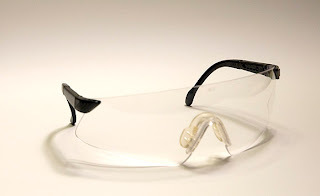 Wear safety glasses to protect your eyes. The pieces of wood can fly off and catch you in the eye if you are not wearing safety glasses. 2. 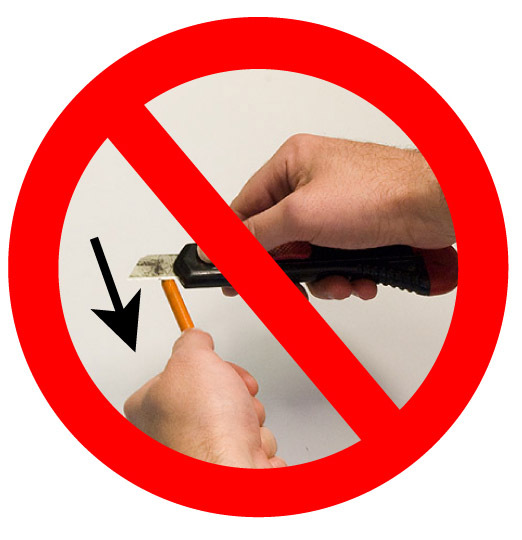 Safety: The dos and don't of carving with a knife. The first thing you need to always consider when sharpening a pencil this way is how to do it safely. We are using very sharp knives to carve the wood away. If we are not careful we can injure ourselves or somebody else. We need to keep ourselves and others out of the path of the knife blade at all times. This includes our hands, fingers, body, and eyes. First, I personally do not use the precision blade for sharpening. I think it is can be dangerous for our purposes here as it not designed for carving in this way. When not carving, close up the knife and put it down. 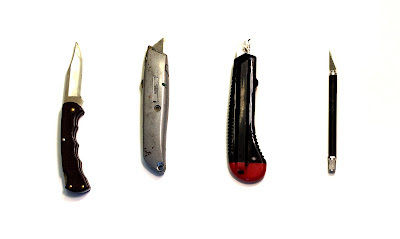 An exposed blade is easy to accidentally grab or unintentionally cut something. Never pull the blade towards you when carving. You could accidentally pull the blade into your hands or body, injuring yourself. Always push the blade away from you when carving. Don't point the pencil in the direction of some one else either. Never put your hands in front of blade when carving. Again the blade could get away from you and you could slice open a figure. 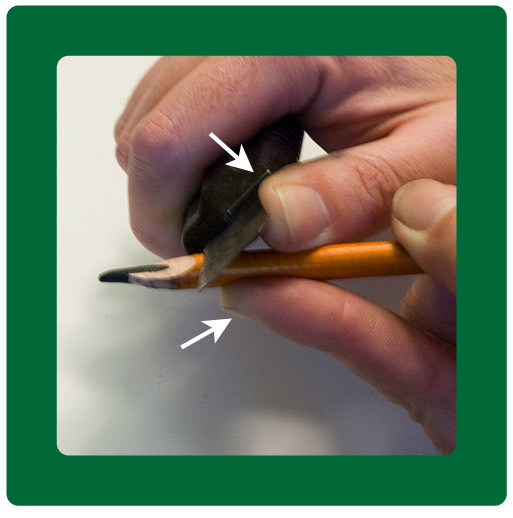 Keep your hands and fingers behind the blade when sharpening the pencil. Hold the pencil at a spot behind the area you plan to carve away from the charcoal. Keep your fingers and hands behind the sharp edge of the blade. I like to put my thumb on the dull back of the blade, reminding me to keep it behind the sharp edge at all times. This may seem like I am being overly cautious here when talking about just sharpening a pencil, but when working with razor sharp tools, safety is always the first priority. Avoiding cutting oneself or injuring an eye is something worth taking some simple precautions for. A. The first step to sharpening the pencil is to start removing the wood around the charcoal so that a section of the charcoal is exposed. B. Rotate the pencil to remove the wood evenly around the pencil. C. Remove enough wood to have about a half of an inch to an inch of the charcoal showing. Any more than that you risk breaking the charcoal when sanding the point or drawing. D. The next step is to start sanding the charcoal to bring the tip to a sharp point. Hold the pencil at an angle against the sanding block. 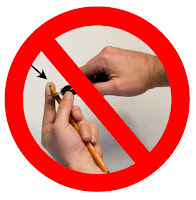 The angle you hold the pencil against the block will determine how fast the point tappers in. I like to have the charcoal come to a point gradually. 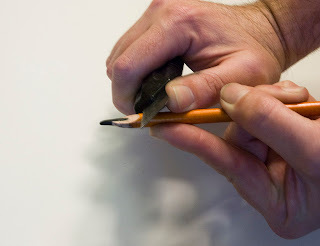 To do this, I hold the the pencil at an angle so that the angle between the pencil and the sanding block is a small one. E. Sand lightly. The charcoal is fragile and will break if too much pressure is applied. F. Rotate the pencil to round the tip of the charcoal as you sharpen it. This is a messy process. Sharpen the pencil over something that is easy to clean. Once you have enough of the wood removed and the charcoal brought to a sharp point the pencil is ready to use. Remember to keep it sharp as you draw and enjoy drawing.